NOTE: "tensor" below is name of the conatiner otherwise use the container id. 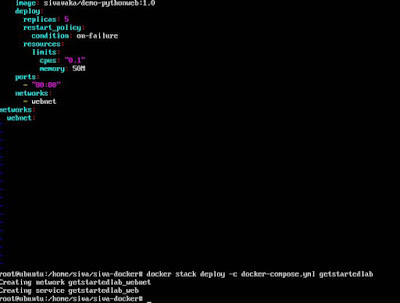 docker ps -a | grep "pattern"
NOTE: Only swarm managers execute Docker commands; workers are just for capacity. NOTE: you may need to use the "--force" to leave the last manager from the swarm. · Volumes are stored in a part of the host filesystem which is managed by Docker(/var/lib/docker/volumes/ on Linux). Non-Docker processes should not modify this part of the filesystem. Volumes are the best way to persist data in Docker. · Bind mounts may be stored anywhere on the host system. They may even be important system files or directories. 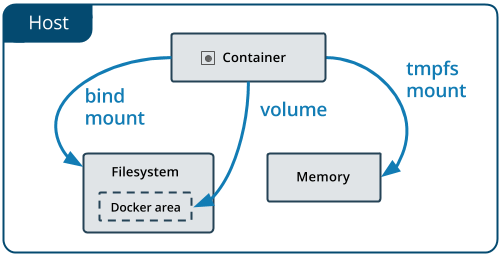 Non-Docker processes on the Docker host or a Docker container can modify them at any time. -v ~/nginxlogs:/var/log/nginx — This will set up a volume that links the /var/log/nginx directory from inside the Nginx container to the ~/nginxlogs directory on the host machine. Docker uses a : to split the host's path from the container path, and the host path always comes first. 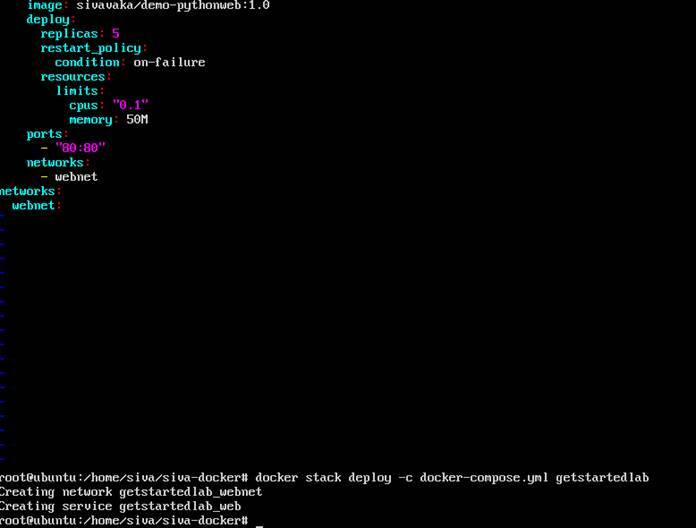 Before you install Docker CE (first time) on a new host machine, you need to set up the Docker repository. Afterward, you can install and update Docker from the repository. 5. Use the following command to set up the stable repository. You always need the stable repository, even if you want to install builds from the edge or testing repositories as well. To add the edge or testing repository, add the word edge or testing (or both) after the word stable in the commands below. NOTE: It will sources url to "sources.list" under /etc/apt repository. 1. Update the apt package index. 2. Install the latest version of Docker CE, or go to the next step to install a specific version. Any existing installation of Docker is replaced. The Docker daemon starts automatically. 3. 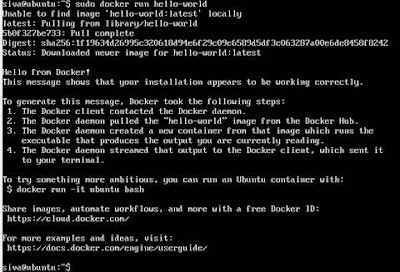 Verify that Docker CE is installed correctly by running the hello-world image. A Docker container can be described as a wrap around a piece of software that contains everything needed in order to run the software. This is done in order to make sure that the app will run the same no matter what environment it runs in. VirtualBox and VMWare are virtualization apps that create virtual machines that are isolated at the hardware level. Docker is a containerization app that isolates apps at software level. Linux cgroups, originally developed by Google, govern the isolation and usage of system resources, such as CPU and memory, for a group of processes. Linux namespaces, originally developed by IBM, wrap a set of system resources and present them to a process to make it look like they are dedicated to that process.